Egypt eases its blockade on Hamas-ruled territory to let injured Gazans through; Israel hits more than 750 terror targets. Egypt opened its Rafah border crossing to Gaza on Thursday to receive wounded Palestinians as Israel continued its air-offensive to stamp out rocket-fire on Israeli civilians, an official at the border said. Hospitals in north Sinai, which borders Gaza and Israel, have been placed on standby to receive the injured, Egypt's official MENA news agency reported. The crossing is usually closed, as Egypt maintains a strict blockade on Gaza in order to isolate Hamas from Islamist insurgents in the Sinai. Relations between Hamas and Cairo deteriorated sharply after the ouster of Muslim Brotherhood president Mohammed Morsi, with Egyptian security forces accusing the terrorist group of aiding jihadis to carry out terrorist attacks inside Egypt in response. 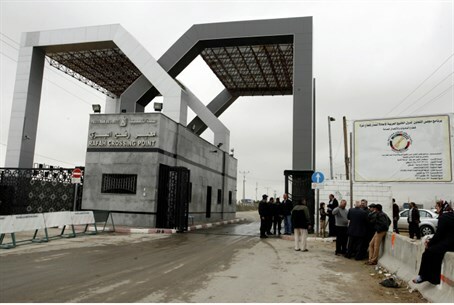 Rafah is Gaza's only border crossing that bypasses Israel, which launched Operation Protective Edge in response to escalated rocket fire by Hamas and other terrorist groups. The air strikes have killed at least 70 people since the operation began on Tuesday; Gaza-based sources claim they include 11 women and 18 children, but those figures have not been independently verified. The IDF has blamed Hamas for civilian deaths in Gaza, citing the Islamist group's open use of human shields. In one instance, seven people were killed after locals responded to an Israeli warning flare by flocking to act as human shields at the site of the intended strike just moments before it was hit. The Israeli air force overnight hit more than 300 Hamas targets in the Gaza Strip in response to rocket fire from Gaza, according to the IDF's spokesman. "We aimed at 322 targets in Gaza overnight, taking to 750 the total number of Hamas targets hit by the army since the start (on Tuesday) of Operation Protective Edge," Lieutenant Colonel Peter Lerner told journalists in a telephone conference. That number is higher than the number of targets hit in six days during the IDF's last counterterrorism operation in Gaza, Operation Pillar of Defense. Among the targets hit were rocket-launching sites of Hamas's "military wing" the Ezzedine al-Qassam Brigades, as well as tunnels used by the group and Hamas command posts, Lerner said. The Israeli Air Force has also been upping the pressure on Hamas's leadership specifically, by targeting their homes in response to continued rocket fire. As a result, IDF sources say that the majority of Hamas's leaders are now homeless. Lerner warned that a ground assault was still being considered. "More than 20,000 reservists have been recruited but a ground assault would be the last option if we judge it necessary," he said. Israel's cabinet has authorized the call-up of 40,000 reservists for such an operation, which looks increasingly likely as the conflict drags on, commentators say. The army says Gaza terrorists have fired some 300 rockets at Israel since the Jewish state began Operation Protective Edge to stamp out the rocket fire. Several of those have landed or been intercepted near Jerusalem, Tel Aviv and the northern city of Hadera. Several rockets even landed as far as Haifa - some 165 kilometers (102 miles) away from Gaza.